Napoli moved within nine points of Serie A leaders Juventus at the weekend with a comprehensive 3-0 win over Sampdoria. Carlo Ancelotti’s side dominated the first half and took a deserved lead through Arkadiusz Milik before Lorenzo Insigne doubled the scoring just a minute later. A Simone Verdi penalty finally put the game beyond Sampdoria’s grasp as their striker Fabio Quagliarella failed to break the record for scoring in the most consecutive Serie A games. 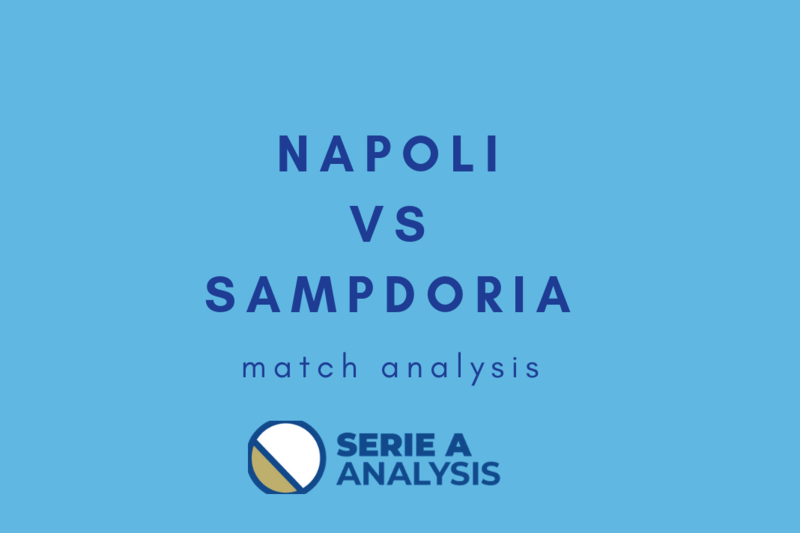 The following match analysis will discuss how Napoli managed such a comfortable home victory over a side who thrashed them in Genoa at the start of the season. Napoli made four changes from their 2-0 away defeat at Milan in the Coppa Italia midweek. 21-year-old Alex Meret maintained his berth between the sticks, Elseid Hysaj and Mario Rui came in in the full-back positions, Marek Hamsik replaced Amadou Diawara and Allan came in for the suspended Fabian Ruiz. The home side started with a front two of Arkadiusz Milik and Lorenzo Insigne in a 4-4-2 formation that could switch to a 4-3-3 in attack with Callejon moving onto the right. The visitors lined up in their traditional 4-3-1-2 with Gaston Ramirez playing in the space behind strikers Defrel and Fabio Quaglirella- who was chasing a Serie A record going into the match. Ancelotti has said before that the 4-4-2 is his favoured defensive formation and after a string of questionable displays earlier in the season (namely a 3-1 loss to Juve and a 3-0 defeat to Sampdoria) he has switched to a slightly lopsided version of the formation. 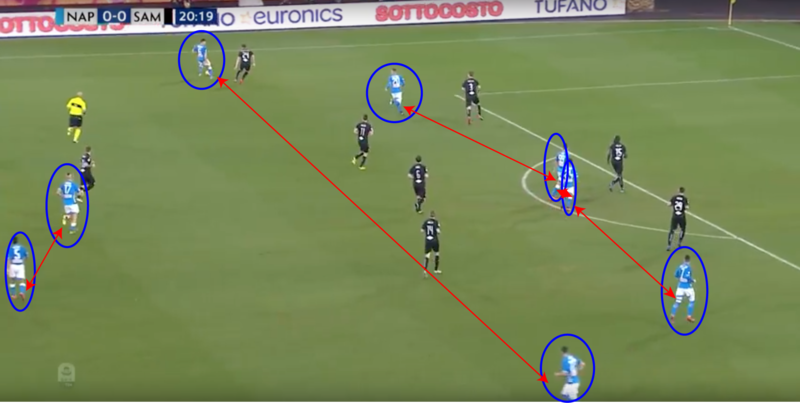 A key aspect of this is Napoli’s excellent ability to play out from the back with Kalidou Koulibaly, in particular, frequently building play with passes or simply running out of the backline. When on the run, the Senegal international would often overtake left-back Mario Rui and supply a ball into the area. 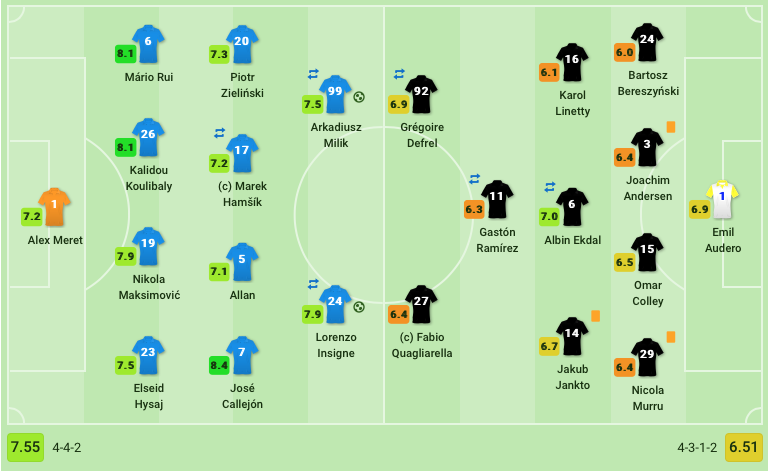 Napoli started without a natural left winger but – thanks to a combination of left-back Rui, left-sided midfielder Piotr Zielinski and centre-back Koulibaly – 44% of their attacks came from the left. Koulibaly is presented with several options when running down the left flank. The home side looked very comfortable playing it out from the back with Allan and Marek Hamsik (who has taken on more of a defensive role since Ancelotti’s arrival in Naples) helping them get out of tight defensive spaces. As the game wore on, Napoli didn’t have as much cover from the midfield and this coincided with Sampdoria’s temporary resurgence in the match. This should be an aspect of Napoli’s game Ancelotti will try to improve with the ageing Hamsik struggling to cope at times and making a few sloppy passes. Aside from that, however, the defence was the key to the nice, fluent passing rhythm that Napoli established in the game- especially at the end of the first half. Allan, Hamsik and Maksimovic create a passing triangle to get Napoli out of danger. From a purely defensive standpoint, Napoli were outstanding on the night. They deployed narrow banks of four tightly glued to each other and were also adept at defending set pieces. The closest Sampdoria really came was from a long range strike from defender Beresynski and a tame bicycle kick from Fabio Quagliarella as the 4-4-2 continued to bear fruit for Napoli. Alex Meret looked good in the game as he was comfortable with the ball at his feet and made a few good stops when necessary and as usual Koulibaly was imperious at centre-back. If Carlo Ancelotti’s side are to make strides in the Europa League and bridge the gap atop of Serie A, maintaining this defensive form will be key. Napoli defended compact and effectively. Of all the tactical tweaks Carlo Ancelotti has made since his arrival in Naples in the summer the most influential is undoubtedly the decision to move Lorenzo Insigne from the left-wing to a second striker. Insigne was deployed in the left of a 4-4-2 midfield against Milan midweek and his side lost 2-0 however on his return to the striker position he was fantastic. He was deployed on the right-hand side of a forward two and would often drop deep and float into pockets of space in the midfield to stitch up play. He was a constant creative outlet for the home side- as well as scoring the second goal as he took 6 shots and completed 88% of his passes. In this shot Insigne drops deep to create chances as Zielinski drifts into the forward two. Insigne would often drop back to the edge of the box to get shots away. He often caused Audero problems from range with his finishing. Insigne is given plenty of time to shoot. The Italian would also drop onto the right wing and swap places with Jose Callejon. He took on a similar role to the one Callejon did last year, in fact. The Italian glided around of the field looking to build up play and find the space in the manner resembling a Ramdeuter. But when he needed to be clinical, he was, and his sharp and incisive movement and finish for Napoli’s second goal was a reminder why Ancelotti deployed Insigne in this new role in the first place. Insigne has space to run into. Insigne was arguably Napoli’s most dangerous forward as he ended his nine game goal drought in a night not short of attacking flare for the home side. He further cemented his place as one of Serie A’s best players and as the touchstone of Ancelotti’s 4-4-2 system in Naples. Sold by Carlo Ancelotti in his first summer as Real Madrid manager, Callejon has become beloved in Naples and whilst he was undoubtedly the least talented of their mercurial front three last season he remains a key player in the side. Deployed on the right side of the midfield four, Callejon often drifted in an out of dangerous areas. In attack Callejon offered the wide-right width in the formation as Elseid Hysaj had a subdued game in an attacking sense and was often isolated on the wing. This was was the case for both of Napoli’s first half goals. Callejon delivered a delightful assist for Napoli’s opener. The Spaniard would often drift into the front two also as well as becoming a member of an attacking four at times in the first half as Zielinski propelled forward on the left and Insigne and Milik attacked through the centre. In this shape, the full-backs were deployed a little deeper than the wide midfielders however as the game played out Mario Rui became the left hand side’s most dangerous attacking outlet as Zielinski sat into a midfield three in possession. Napoli attacked in a 2-2-2-4 shape in the first half. Callejon was the tactical key to exploiting the lack of defensive cover in wide areas Sampdoria’s 4-3-1-2 formation offers and his two assists were the most impressive moments of individual quality throughout the match. He also put in a defensive shift, making three tackles. All in all, it was another terrific game for the unsung hero of the Stadio San Paolo. This was the first time I’d seen Napoli play this season under Carlo Ancelotti and I was very impressed. He seems to have evolved the side past Sarribal. Whilst the football they play may not be the free-flowing exhilarating stuff we saw from Gli Azzurri last season it’s a more refined and defensively sound approach. They established a nice tempo and were in complete control of the game from the minute Arkadiusz Milik put the home side 1-0 up. Next up Napoli face a tricky away tie at Fiorentina before travelling to Zurich for the first leg of their Europa League Round of 32 tie. Sampdoria, meanwhile, play second bottom Frosinone at home on Sunday where they’ll hope their push for European football will continue. Previous articleHow did Parma hold Serie A giants Juventus? Sandro Tonali: The New Pirlo?